Pohnpei State Environment Protection Agency (EPA), in collaboration with the Japan International Cooperation Agency (JICA), hosted the 2nd State Level Joint Coordinating Committee (JCC) meeting in support of Phase II of the Japan Technical Cooperation Project for Promotion of Regional Initiative on Solid Waste Management in the Pacific Island Countries (J-PRISM-II) on October 11th, 2018 at the Pohnpei Governor’s Conference Room. Chuuk, Yap and Kosrae also hosted their 2nd State Level JCC meetings with respective key stakeholders. Japan’s J-PRISM II Team facilitated all 4 JCC meetings in collaboration with each state Project Counterparts. In his opening remarks, EPA’s Executive Director Mr. Henry Susaia welcomed and acknowledged the presence of His Excellency Mr. Ryoichi Horie, Ambassador Extraordinary and Plenipotentiary of Japan to the FSM, Honorable Pohnpei State Lt. Governor, Reed Oliver, Madam Ginger Porter Mida, Chairman of the Board of EPA, representative from the National Dept. of Environment, Climate Change and Emergency Management, representatives from Office of T&I and Pohnpei Waste Management Services (PWMS), and other members. 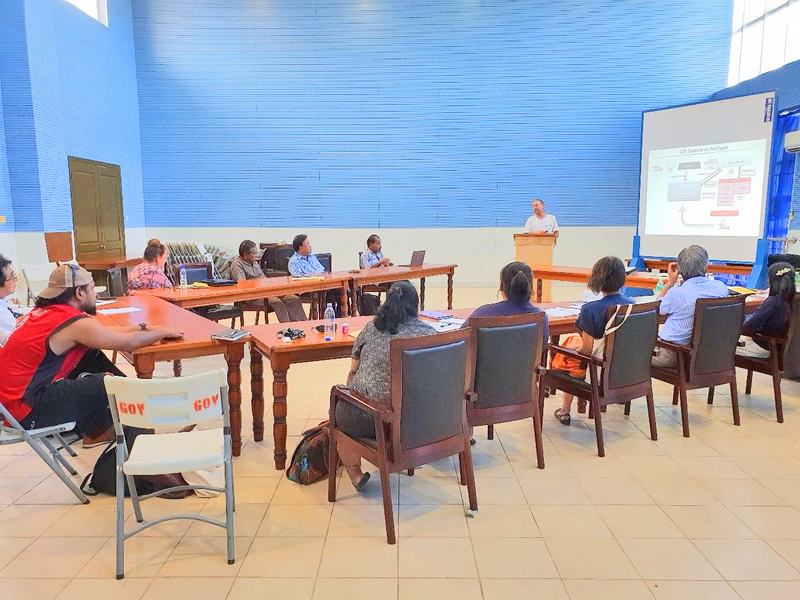 The purpose of this year’s JCC meeting was for participants to share updates on the progress of J-PRISM II with emphasis on the need to formulate the State Solid Waste Management Strategy (SSWMS) in Pohnpei. In addition to the overall progress of J-PRISM II, the J-PRISM II Team discussed activities to focus hereafter specifically the formulation of SSWMS, compilation of good practices and how to improve the Container Deposit Legislation (CDL) system. The current Solid Waste Management (SWM) situation was analyzed technically and the result of the analysis was shared among key stakeholders. According to Pohnpei EPA, the SWM challenges include mainly the improvement of CDL program and waste collection system and proper management of Final Disposal Site. CDL Expert, Mr. Alice Leney concluded the JCC meeting with insights on improvement of CDL system in Pohnpei. Mr. Leney shared the system constraints as well as explored solutions with the key stakeholders. Pending actions includes the finalization of the SSWMS with a five-year Action Plan with gained support from State leaders. The signing of the Minutes of Meetings concluded the three-hour long meeting, following the closing remarks from His Excellency, Ambassador Horie, who acknowledged EPA for their willingness to accelerate improvement of Solid Waste Management in Pohnpei and encouraged other key stakeholders to do the same. The Minutes of Meeting was signed by JICA, Pohnpei EPA, State Department of T&I and J-PRISM II Team Leader.